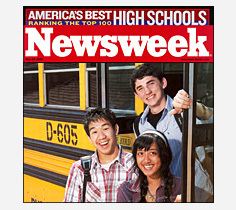 Newsweek's newly released annual ranking of America's top high schools includes four schools in the Long Beach Unified School District, all of them making repeat appearances on the prestigious list: CAMS (California Academy of Mathematics and Science), Wilson Classical High School, Renaissance High School for the Arts, and Polytechnic High School. The annual list represents only the top 5 percent of all U.S. public high schools, reporter Jay Mathews explains at newsweek.com. To determine the rankings, Newsweek takes the total number of Advanced Placement, International Baccalaureate or Cambridge tests given at a school in May, and divides by the number of seniors graduating in May or June. “To send a student off to college without having had an AP or IB course and test is like insisting that a child learn to ride a bike without ever taking off the training wheels,” Mathews writes. All four LBUSD schools in the 2007 rankings also appeared on last year’s list. Record numbers of students in the Long Beach Unified School District have enrolled in Advanced Placement courses this year, helping them to earn college credit while still in high school, giving them a competitive edge and potentially saving their parents thousands of dollars on college tuition. A total of 4,094 students have enrolled in AP courses for the 2006-07 school year, up from 2,309 in 2000-01. Performance by LBUSD students on Advanced Placement Exams now ranks higher than state averages in the following subject areas: Calculus AB, Calculus BC, European History, German, Music Theory, Spanish and Physics B. The number of students in these college preparatory courses has increased steadily since the school district began a concerted effort to prepare more students for success in college and beyond. Long Beach Unified was one of the first school districts to pay for and require students to take the PSAT exam in tenth grade, helping to identify more students who have the potential to attend college. The school district in recent years also has provided AP Summer Bridge workshops for hundreds of students new to Advanced Placement courses. The overall increase in AP enrollment here has included significant increases for each of the district’s major ethnic and racial groups.